Title : Arabia Felice Nuova Tavola. 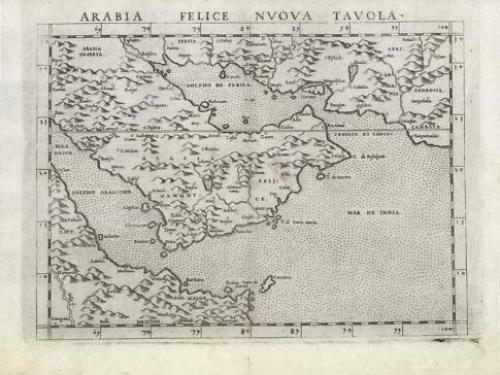 Uncommon first edition of this classical map of the Arabian Peninsular, is an enlarged version of Giacomo Gastaldi's published in 1548. Girolamo Ruscelli's edition of Ptolemy's Geographia included newly engraved copperplates by Giulio and Livio Sanuti. The curious fact is that this map is one of two that were engraved on the same plate, printed and than separated for the book. This can be seen in the atlas by the fact that the plate mark of the map runs off the top of the page. In 1574 a new plate was used which lasted until the final edition of 1599.